The Gitnadoiks River Provincial Park is located in the heart of the Kitimat Ranges of the Coast Mountains. The Kitimat Ranges are characterized by dome-like granite mountains with many sheer bare faces and numerous waterfalls. Elevations within the park range from about 100 metres in the valley bottom to about 1,800 metres on the surrounding ridges and peaks. Angling enthusiasts should take note of the excellent sport fishing opportunities available in the park. At least 13 species of fish occur in the area, including Pacific salmon (five species), rainbow and cutthroat trout, Dolly Varden char, and mountain whitefish. Visitors are reminded that this is a wilderness area and that proper gear and transportation arrangements are required. Swimming is not recommended along the rocky shoreline at Alastair Lake. Please note that there are no lifeguards on duty in provincial parks. 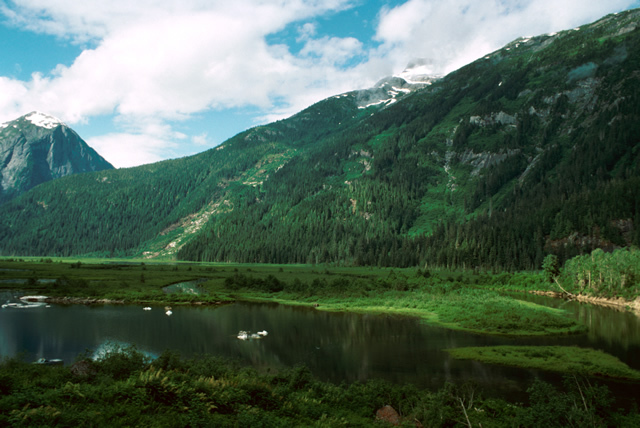 The park is located approximately 50 km west of Terrace on the south side of the Skeena River. The closest boat launch is located at Exchamsiks River Provincial Park. The closest communities, towns and cities are Terrace (50 km east of the park), Port Edward (80 km west of the park) and Prince Rupert (90 km west of the park). Wildlife: Park visitors are likely to spot moose, beaver, otter, mink and wolves in the valley bottom areas, while higher up, mountain goats may be viewed on the rock faces and slides. Birdlife includes a variety of waterfowl, shorebirds, eagles, hawks, hummingbirds, swallows, thrushes, crows, woodpeckers, warblers and sparrows. It has been confirmed that the Trumpeter Swans nest in the park – this is one of only three confirmed nesting sites known in the province. There are canoeing and kayaking opportunities in this park. Visitors must be experienced paddlers capable of traveling in strong river currents. Technical navigation is required. Flash flooding often occurs after rain events. Angling enthusiasts should take note of the excellent sport fishing opportunities available in the park. At least 13 species of fish including Pacific salmon, rainbow and cutthroat trout, dolly varden char, and mountain whitefish occur in the area. Anyone fishing or angling in British Columbia must have an appropriate licence. Hunting is allowed in the park. Please check the BC Hunting & Trapping Regulations Synopsis for more information. There is one backcountry public use cabin located on Alastair Lake. There is also a private cabin and a permit-approved private trappers cabin not authorized for public use. No firewood or fire rings are available. If you have to make a fire, keep it minimal, make sure it is extinguished, please spread ashes and rocks about. Wilderness, backcountry or walk-in camping is allowed, but no facilities are provided. There is no road access to this park.